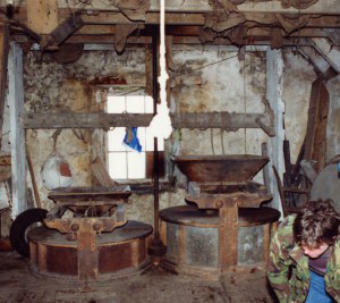 Visitors are encouraged to watch the video of this Mill, with local people operating the machinery, prior to their tour of the Mill and displays of local history; following which they are invited to browse through the locally made craftwork and souvenirs in the Craft Shop and Reception area where light refreshments are always available! The Quendale Estate dates back to the 16th Century but it wasn’t until 1770 that the Grierson family acquired it and became the Lairds. The Mill was commisioned to be built in 1867 by the Grierson family and grinding began at the Mill the following year. 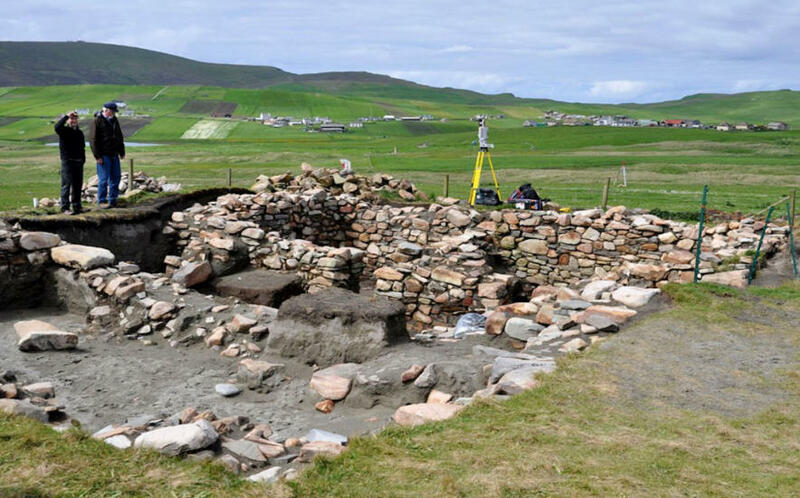 Its primary purpose was to handle the grain for crofters from a very wide surrounding area. Most of the grinding was done in winter when there was plenty of water in the dam to drive the Mill’s machinery. John Anderson from Forfar was the first miller, followed in 1870 by James Burnett. In the late 1870’s, Charles Langskail took over and held the job until Alex Simpson from Aberdeenshire succeeded him in 1886. He continued until George Leslie of Laxfirth took over the farm in 1899. Laurence Leslie, a young Dunrossness man, had trained with Alex Simpson and was now given the job of miller, a post he was to hold for most of his working life. The Mill by this time was extremely busy with carts coming with loads from all over Dunrossness; storage space in the Mill and outhouses were filled to bursting point. At this time the only other large Mills in Shetland were at Weisdale and Girlsta. Laurence Leslie continued to work at the Mill until 1911 when he had to take leave due to health problems caused by the amount of dust generated through milling. Mr Scott filled in for him until he returned two years later. This time he worked for another three years and then joined the Naval Reserve and Adam Eunson took over the post as miller. When the war ended Laurence Leslie once again returned to the Quendale Mill to continue milling and stayed until 1930 before deciding to move to Vancouver with his family. Andrew Arcus, who had worked with Laurence Leslie in the late 1920’s, then took over milling at Quendale Water Mill. It was unfortunately short-lived as he caught his hand in the cogs of the machinery and had to step down from the post as miller. Laurence Leslie had returned from Canada in 1932 and was called on again to take up the post as miller at Quendale Water Mill. He continued here until 1941 when Adam Eunson took over once again. Adam Eunson stayed in charge until the Mill ceased operations in 1948. During the time the Mill was in operation, crofters brought their Oats and Bere by horse and cart to the Mill to be processed into Meal for eventual use in the production of Oatmeal and Beremeal bannocks – a staple diet for Shetlanders at the time (and still enjoyed to this day). Once roads had been improved to allow vehicular transport, crofters from as far afield as Scalloway and Whiteness (40 kilometres) also joined the others in bringing their grain crops to the Mill for processing. Prior to the advent of “industrial” milling at Quendale Water Mill the quern stone was the common method used on crofts to grind the bere. We have one at the Mill where you can have a go and see how it once was done. Today the Mill is completely renovated and restored. 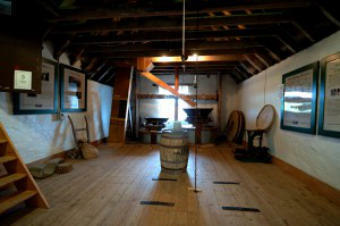 The South Mainland Community History Group, who now operate the Mill as a quality visitor attraction, were greatly helped financially in the costly renovation work by the Shetland Amenity Trust. For the last few years teams of archaeologists and scientists of various disciplines have been investigating the causes and the impacts of the massive sand movements that created the Quendale Links. One historically known result of the sand blowing inland was the destruction of the properous township of broo (or “Brew”, or “Brow”). Further research will be conducted in 2018, when we hope to follow the progress being made. A very interesting documentary on the history of this part of the South Mainland of Shetland. Thanks to Alasdair Wilkins for sharing his work with us.